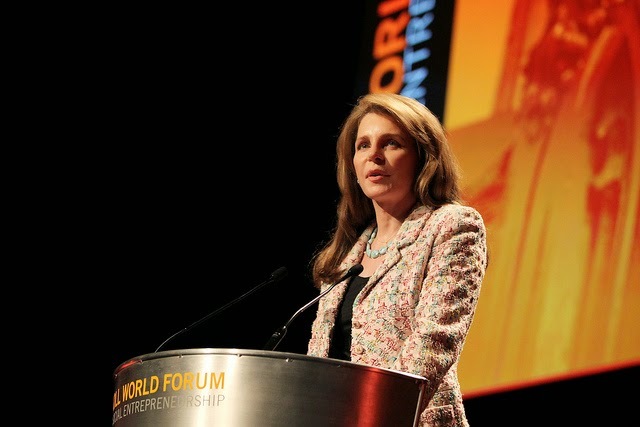 For more than 30 years, Her Majesty Queen Noor al Hussein has been a thoughtful and passionate supporter of education, the arts and women's rights in Jordan, a position that has required some careful diplomacy as the first American-born queen of an Arab country. Even after her husband King Hussein's death in 1999, her international portfolio has included work on behalf of anti-landmine and anti-nuclear weapons organizations and the United World Colleges. Oh, and did we mention her hair? "There seems to be an unwritten law that every press report about me must contain the phrase 'mane of blonde hair,'" she acknowledged in her 1996 Kennedy Center speech, part of the Greater Washington Society of Association Executives distinguished speakers series for that year. Threaded together with her personal experiences, it's a fascinating, free-ranging talk about the recent history of the Middle East and the mistrust that still characterizes many of the exchanges between the region and the West. Consider using your venue as part of the story. Queen Noor takes advantage of the Kennedy Center setting to establish her background as a Kennedy-generation student (in the first co-ed class at Princeton) who had considered a stint in the Peace Corps. This information, right at the start, gives her audience a sneak peek at her international and idealistic orientation toward the challenges she met later in Jordan. ...I was soon able to empathize with the frustrations of women around the world whose activism for public well-being commonly generated attempts to define them primarily in material rather than intellectual terms--in terms of gender and domesticity, their hairstyles and clothing. These days, you're most likely to hear from Queen Noor on Twitter (@QueenNoor) where she maintains her own active account. In a 2012 interview with The Telegraph, she singled out social media as an especially important part of making women's voices heard during the Arab Spring uprisings. Social media, she added, also helped "people to understand that women in the region are not a subservient, passive and homogeneous group, but in fact they represent many different viewpoints."